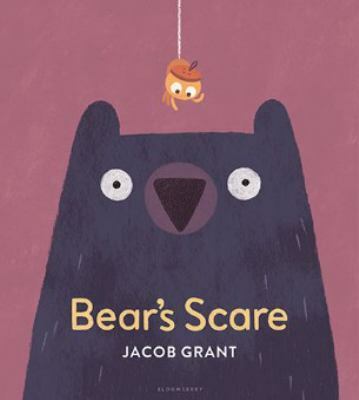 Bear’s Scare is an utterly charming, delightfully illustrated story about a very tidy bear, a friend in need, and an unexpected visitor (I’m going to warn you right now, this visitor has eight legs). Through warm, textured images and light narration, author-illustrator Jacob Grant introduces us to Bear, fastidious housekeeper and caretaker to one small, stuffed charge: Ursa. Domesticity is bliss, until one day, Bear makes an alarming discovery: someone ELSE has moved into their house—someone who spins sticky webs and borrows Bear’s books! Illustrations of Bear frenetically overturning furniture are juxtaposed with those of the eponymous “Scare” enjoying quiet, homey comforts—a simple and effective irony that all ages can appreciate. But when this playful chaos leads to tragedy, Bear is compelled to reconsider the many-legged arrival in a new light: perhaps the terrifying interloper of our imagination might actually be a welcome friend and neighbor. Grant puts this classic lesson to the page with such energy and style that it feels fun, fresh, and not at all moralizing or saccharine. Text is kept to just one or two sentences per spread, letting the art rightfully take center stage, and the characters of Bear, Ursa, and the “Scare” are goofily adorable. With its wit and charm, Bear’s Scare is sure to win hearts. Posted by Kerry B. on December 12, 2018. Read more reviews by Kerry B.